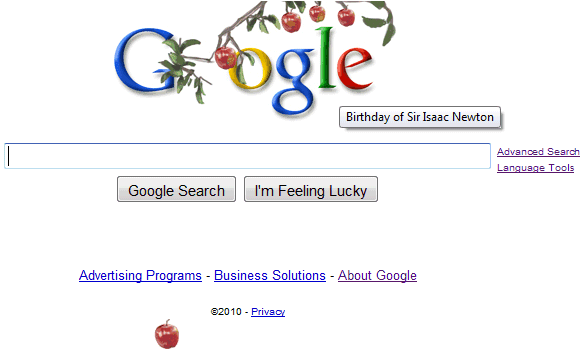 Google's US homepage uses an animation to celebrate Isaac Newton's birthday. After loading the page, an apple falls from the tree to illustrate Newton's theory of gravity. It's the first time when Google uses an animated doodle on its homepage. Now that users got used to the fade-in animation that exposes Google's navigation links, Google will try new ways to make the homepage more interactive. ...except that Newton's real birthday was 25 December. It's only being celebrated on 4 January, because of the conversion from differing calendars of what was in use then to what is in use now. It was a little bit annoying, the apple falling over the search box was a distraction after the fist few page loads. This animated doodle was also available on Google India's home page yesterday (Jan 4). I assume it was seen in many countries as well. Ah excellent catch there... "The Apple is falling..." nice... Those Google folks are so sneaky deaky. Very nice touch for a change. Some people actually overlooked it. Some people don't even go to the google homepage anymore. They use other search query mediums. This is a disadvantage to Google, because they could really promote new things features on their site. There are so many things about Google, people don't even know about. Putting it in a search results ad wouldn't work, because people become conditioned to ignore ad sections. it was really an animated doodle? oh damn it I wanted to see that and I missed it, do you know if there a website or a blog when I can see all Google Doodle that have been created so far? i want more annamated google home pages their fun and get peoples attention. bye the way i like the comitition doodle for google i partisipated in it.